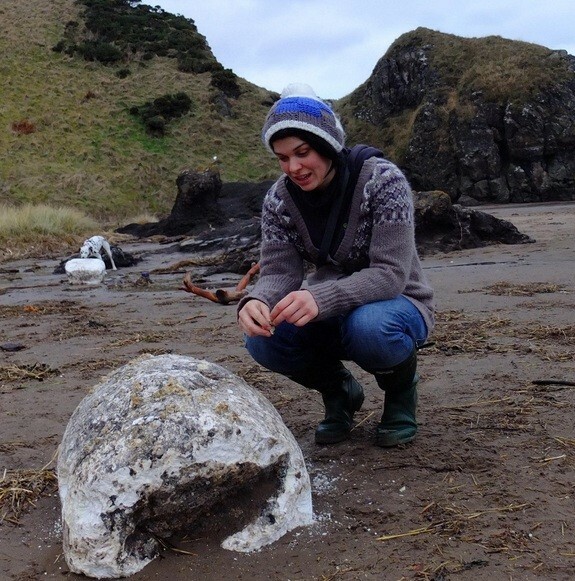 After storms lashed Scotland over the holidays, some strange World War II-era relics turned up on the country's chilly coast, including decades-old lard from a shipwreck and bunker blocks buried on a beach, local officials said. At St. Cyrus Natural Reserve, about 100 miles (160 kilometers) north of Edinburgh, four large chunks of lard washed up after the storms. Though their wooden containers disintegrated long ago, the lard chunks retained their barrel shape, and they were still bright white under a thick crust of barnacles, local officials said. "It's given us some interesting sights recently on the reserve: I'm sure there have been people wondering what on earth has washed up on the beach. The lard was covered in the largest barnacles I've ever seen," Alampo added. "Animals, including my dog, have certainly enjoyed the lard, and it still looks and smells good enough to have a fry-up with!" Vicki Mowat of SNH explained to LiveScience in an email that scientists haven't examined the lard yet, and the story of its origins comes from local history and knowledge. A reserve volunteer, Lainey Rees, gets a closer look at the lard, while a dog in the background enjoys investigating another chunk of the washed-up fat. "The lard was washed up for the first time after a merchant ship was bombed during World War II, and has continued to wash up every few decades after bad storms when we believe the wreck has been subject to deep swells," Mowat said. Local resident, Angus McHardy, told SNH that he first saw fat washing up on the beach in the early 1940s. "Some barrels were complete and others were just lumps," McHardy said. "People collected it. My grandma boiled it up to get the sand out. It was great because we couldn't get fat during the war." Farther south, at Tentsmuir Nature Reserve, beach erosion exposed a narrow-gauge railway and concrete bunkers, as well as corrugated iron sheets that were used as molds for creating coastal sea defenses during the war. The waves also sent some odd sea life onto Tentsmuir's beaches, including a dead octopus, sea anemones and the so-called dead man's finger sponge. And much farther north, in Scotland's Shetland Islands, the holiday storms turned up even older finds. A skeleton, possibly 2,000 years old, was exposed when a cliff was eroded at Channerwick alongside the remains of Iron Age buildings. In fact, nature is known to reveal human history. For instance, remains of hominids — a juvenile male and adult female who lived nearly 2 million years ago — were discovered in the far reaches of a limestone cave system that had eroded over time. "We are looking at very eroded and denuded portions of this cave system, where nature has exposed what had once been the deep reaches," said researcher Daniel Farber, an earth scientist at the University of California at Santa Cruz, in 2011 at the time the discovery was announced. In addition, melting patches of ice that had been in place for thousands of years in the mountains of the Canadian High Arctic revealed a treasure trove of ancient hunting tools.